Monica Gresser, the owner and principal architect at Brazen Architecture, is carving a niche as both an architect and advocate for the homeless and medicinal marijuana. Growing up close to NASA’s Johnson Space Center in Houston, Gresser dreamed of building spaceships. However, after taking her first drafting class, a high school teacher asked if she’d considered being an architect. 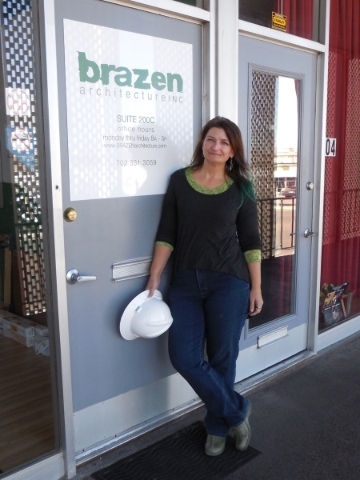 From the moment she found out what an architect does, Gresser was on her path to success. Gresser became part of Habitat for Humanity in her first year at the University of Houston. She explained “everybody in that organization was a senior; they were all leaving.” With no idea of her own abilities, she took on the task of leadership along with a few others. With the help of advisers, Gresser and other students started “The Habitat Studio.” They designed five houses for Houston Habitat for Humanity and in the spring worked with families to build them. She received her bachelor’s in architecture from the University of Houston. 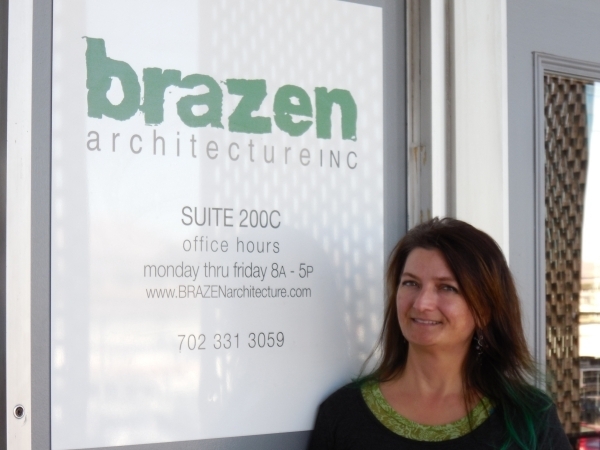 After living in Baltimore, she and her husband moved to Las Vegas where has been an architect for nearly 15 years. As the owner and principal architect at Brazen Architecture, she has come out as an advocate for the homeless. She is starting “Brazen Conversations,” which she envisions as a forum for discussion of community issues with an emphasis on finding solutions. Q. How did you become involved in homelessness in Las Vegas? A. I indirectly got involved with homelessness through AFAR because they were doing a call-out to volunteers to come help with this new property and they were just going to paint it, but, my signature on my email was Monica Gresser Architect. So, they asked me to come in and do some plans. So we just did some preliminary stuff and then I realized that’s really what I should be doing because I kind of missed that from college. So then I worked with a guy over here who runs Veteran’s Village, Arnie, and we did some preliminary conceptual kind of things for Variety Early Learning Center, because they’re moving from D Street over to Lorenzi Park in the future. So we did some initial stuff for them and then did some stuff for Veteran’s Village. I was reading this article about Meredith Spriggs and I thought that’s really what I need to do is find those kinds of people in order to start doing more advocacy architecture. Somehow, that’s how I started to do community design; finding those kinds of people. So, I called her up and we chatted for a long time and I said I had this idea for veterans’ housing and I think you could use it. I wanted it to be transitional housing for vets to transition back into single-family living, or something like that, “normal life.” She said that was a fantastic idea and she was thinking along similar lines. So from there I starting following her. I followed her one time to see really what it is that she does, how she interacts with people, because it really didn’t make any sense to me at all. It takes a special aptitude to do homeless outreach. I don’t have it. I’d just take everybody into my house and we’d all be homeless after that. It’s a very large population. I was talking to Nevada Partnership for Homeless Youth about how many kids are actually on the street. They’re not 100 percent sure really how many there are but I believe it was 2009 till now it almost doubled. So there are roughly 11,000 youth on the street right now. That’s just crazy. Q. From your own experience what is the biggest misconception of the homeless? A. I volunteered with Meredith … the whole thing kind of threw me because the woman I was helping … she had several degrees, she had a doctorate, she had two masters degrees, and she’d been at the university level, and suddenly her husband wasn’t around anymore. She lost her house, she lost her job … and I’m thinking, I could lose all of that and then where would I be? Am I prepared for that? I don’t know. I don’t know what happens to you when all of these things go wrong. So that’s how I could become homeless. I think most of us think the homeless people are a bunch of crazy nut jobs who have put themselves there. They were gamblers, they were drug addicts, whatever they were. They were horrible people who put themselves there but not everybody is that way. What I hope comes out of this is that we look at homeless people as people. Not as something on the side of the road. Or, in my way, something that smells. These are actual people. Q. Why did you decide to go public with your support of the medical marijuana industry and how are you involved? A. I think there’s an important aspect to medical marijuana. My mom died of cancer. I really wish that would have been available to her, legally. She wouldn’t even try it because it was illegal where she lived. It may have helped her. I don’t know. It would have been nice for her to have been able to live a little differently for the last seven years of her life, when she got cancer for the second time. The way I am involved, I have projects in the medical marijuana industry. We provide design work for the dispensaries or grow (facilities) or whatever. We do commercial work as well, even though I want to move into community design.